When you are decoring your home, it is important to remeber the little details. Clocks can often be an afterthought in the design process, but they can add a lot to the room. Here are a few decorative clocks to buy in the UK to give you a glimpse of the many possibilities out there for your home. There are many traditional style clocks such as the large circular roman numeral and number wall clocks. Square wall or digital clocks are also commonly seen in many homes. But what if you want a more decorative clocks in the uk? This is a place to check out if you like the "Keep Calm" sayings that are seen everywhere on everything. They have "Keep Calm. There's Plenty of Time." The more recent clock trends that they offer include clocks with the London Underground routes, aeroplanes, old school tapes, and many other options available as backgrounds to the clocks. Apple fans out there would love the wall pad apps clock where each app represents an hour. There seems to be a clock to fit anyones interests and styles. Amarais another site that has different styles of clocks. If you don't like the traditional circular or square clocks this might be a place worth checking out. 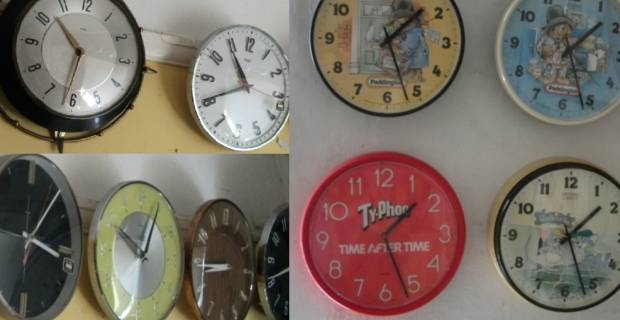 There are a few clocks that are made offeltwhich is a pretty uncommon material to use. There is also a wide range of Cuckoo clocks where some are crocheted and others are more traditional chalet style. For those that want to go completely different,Red Candy have some crazy colorful and wacky styles that would add to the room feeling uniquely you. They have everything from a disco clock to one made out of colourful utensils. A cage style clock and rainbow clock can also be found on their site. Finding different decorative clocks in the UK can be easy enough to do, but choosing one within your budget can be a bit tricky, especially if they need to be delivered. Check out local businesses and support the local economy and artists if possible. Clocks can be pricy, so you may even be able to discuss some type of discount with the local business owner versus buying it online.